Foucault Studies is the only international journal in the English language devoted to the work and influence of the thinker Michel Foucault, often listed as the most cited contemporary author within the human and social sciences, also in the Nordic countries. 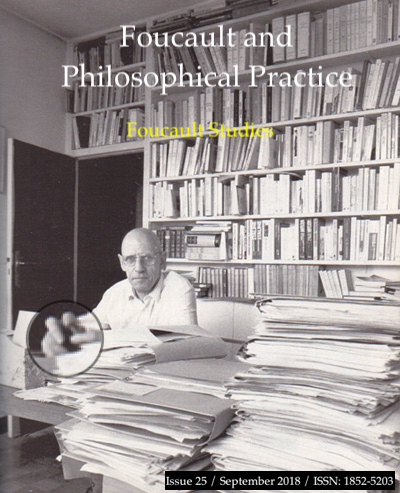 Contributions to Foucault Studies are not limited to the examination of his work, but advance the analytical, empirical and practical use of Foucault's thought across all disciplines. The editorial team lists co-editors from all continents. Whereas SCHIMAGO’S Journal Ranking List for Philosophy 2017 sets off Foucault Studies as number 2 out of 79 Open Access journals, it ranks Foucault Studies as number 80 out of 528 listed journals. The former demonstrates that Foucault Studies is an international Open Access journal of the highest standing. The latter indicates that the journal makes a decisive contribution to the recognition of Open Access publishing, since the journal is here ranked in theupper 15%, over and above a number of established ‘closed’ access journals. This outstanding position is the result of a sustained and steady but also still pointed progress. In 2016, SCHIMAG0’S Journal Ranking list for Philosophy ranked Foucault Studies as number 124 out of 446 journals and set off Foucault Studies as number 6 out of 56 OA journals. In accordance with the professed policy of the journal, Foucault Studies would like to continue contributing to the recognition and propagation of Open Access publishing. An international evaluator appointed by NordForskto assess the journal in 2014 for the NOP-HS Scientific Journal Grantgave Foucault Studies the top grade 6 (a journal at a very high international level and of great Nordic and international interest) out of 7 in all categories. With regard to "academic profile and standing," and "scientific quality," the scholar states that "the status of Foucault Studies is very high internationally. Being involved in Foucault research, I would say that scholars I know who work on Foucault desire to be published in Foucault Studies first (..). Moreover, the journal is well-known for its special issues, which make a real contribution to ongoing debates." In the overall evaluation of the journal, he stressed: "Foucault Studies is an excellent journal. I would be honored to publish in it. The strengths of the journal are its unique status. In addition, FS is a strong journal because of its interdisciplinary nature and the originality of its publications." Another appointed evaluator confirmed grade 6 with regard to scientific standing and editorial board; and sums up by stating that "FS is an international journal of high quality." Both evaluators laud the cross disciplinary and inclusive nature of the journal.